If you take two to four kids, give them a basket of books that go together in some way, and then provide time for them to read, think, and talk together about their ideas, questions, and wonderings, you get this book's simple recipe for a reading club. While your students are reading and talking about their interests and passions, they are also orchestrating all of the reading skills and strategies they've learned and applying them in real-life ways. 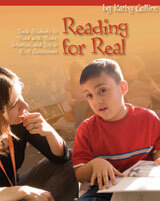 The book offers step-by-step support for implementing these classroom reading clubs, including suggestions for planning reading clubs; charts with teaching ideas; mini-lesson ideas and examples of reading conferences; suggestions for differentiating instruction; sample note-taking sheets, and more.